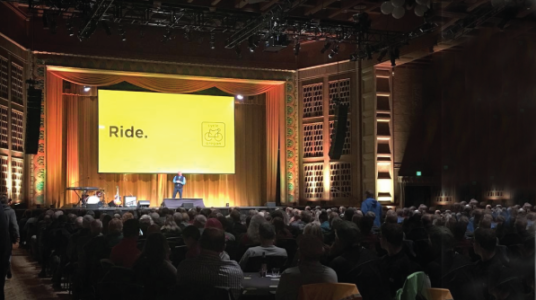 Where Will Cycle Oregon Take Us This Year? The night you’ve been waiting for all winter is finally almost here! The night where you raise a drink with long lost cycling family. Where you talk shop with some of your favorite brands and soak in the live music. And, most importantly, it’s the night where you first hear about every spectacular winding road, breathtaking vista and inspiring community Cycle Oregon will be visiting in 2019. Mark your calendars to join Cycle Oregon and all your favorite bike friends at the Portland Art Museum on Wednesday, January 30th. Doors fly open at 6pm and the first 500 guests become eligible for early registration, guaranteeing themselves a spot on the iconic Classic ride. And if that’s not enough to get you out on a Wednesday night, one of those first 500 will be the lucky recipient of the GOLDEN TICKET – a free entry to the Classic! Can’t be There? No Problem! If you can’t make it in person, you can still attend the Kickoff through the magic of technology! The event is livestreaming the event in its entirety and one lucky virtual viewer will also get the chance to win a free entry to the Classic ride! But you’ve got to watch to win!